It takes approximately one pound of carrots to make an eight-ounce glass of carrot juice. There is no way a person could eat a whole pound of carrots at one time, and even if they could they would lose over 65% of the nutrients in the digestive process. By drinking an eight-ounce glass of carrot juice, you are putting into your body the nutrients contained in a whole pound of carrots, and over 90% of those nutrients are reaching cellular level. An eight-ounce glass of carrot juice, mid-morning and mid- afternoon, gives the body incredible energy as well as taking away hunger. At the Gerson Hospital in Mexico they are healing terminal cancers using (8) eight-ounce glasses of carrot juice per day, along with a vegetarian diet. Carrot juice must contain active enzymes. All carrot juice that comes in cans is dead; the nutrients have been destroyed by pasteurization. Frozen carrot juice and powdered carrot juice have suffered loss and will not give the same results. It is important to me that the carrots be grown in California because California carrots are grown in mineral- rich soils. 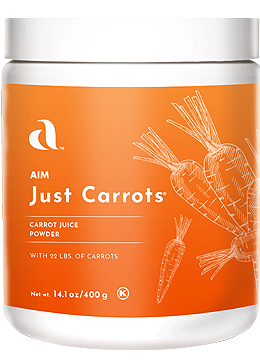 It is the trace minerals that make carrots sweet. 'Look Mom' or 'Bunny Luv' are two brands of California carrots that are available in most supermarkets or health food stores. The most economical way to buy carrots is in 25-pound bags, which will fit in most refrigerators and if kept sealed will stay fresh for a month. Twenty-five pounds of carrots will produce approximately 25 eight-ounce glasses. For all those who have a juicer, try to add at least two glasses of carrot juice to your diet each day for the coming week, and if you don't have a juicer, you might consider purchasing one. We recommend the Champion juicer, the Green Life juicer or the Green Power juicer, especially if a person is dealing with a serious physical problem. A spinning basket juicer is certainly better than nothing if that is all one can afford. Blenders do not produce carrot juice--they only blend the fiber and juice--thus defeating the very purpose of juicing. NOTES: The Champion Juicer is a little easier to use and clean. The Green Life and Green Power juicers take some arm and stomach muscles to push the larger carrots through the gears. The Green Life and Green Power juicers do help preserve the juice allowing you to store it in the fridge and juice every other day if desired. When storing juice in the fridge it is best to put in in a jar with a tight lid with the juice all the way to the top of the jar to minimize the air in the jar. Juicing carrots is time consuming. Much to the demize of well intentioned buyers, most new juicers end up on a 2 to 6 months from the time they are purchased. Juicing takes time. Plan on 30 to 45 minutes minimum every day. While it is great at first, this is a time commitment that most aren't willing to maintain. Fortunately there is an option. When you can't juice carrots, increase the BarleyLife you take and take Just Carrots. BarleyLife and Just Carrots contain live enzymes, are very nutritious and always ready to take. Recommended reading: FRESH VEGETABLE AND FRUIT JUICES by Dr. N. W. Walker, the "inventor" of carrot juice. Why Juice? Why not eat the carrots?